Nestling at the foot of the Magaliesberg Mountains, in a declared bird sanctuary, on the banks of the Hartbeespoortdam, Magalies Park is one of South Africa's Premier Timeshare Resorts. The accommodation on offer is of the highest standard and we continually strive to maintain the best in product and service excellence. Each unit includes a private bathroom/shower, fully equipped kitchen, lounge with a selection of DSTV channels, air-conditioning and/or ceiling fans, a patio complete with braai facilities. Magalies Park has a 18-hole golf course and the total length of the course is a men's 5864m and a ladies' 5001m. Magalies Park hosts a 6 day entertainment program for all ages. The entertainment centre accommodates the teenagers with pool tables and pc games, toddlers with movies and books and blocks and the adults with board games and bingo. During the summer we offer our activities around the pool deck where parents can relax whislt we keep the kids busy. The resort offers 3 swimming pools, 1 kiddies pool, 1 covered heated pool, adventure golf, paddle boats, canoes, 3 tennis courts and 1 kiddies tennis court, squash courts, volley ball, giant chess, bird and nature walks, jogging route and a 50 seater Cruiser that can take you out on the Hartbeespoortdam for an hour to two hour cruise. The Kolgans cruiser is also very popular for private functions. When the going gets tough take a break and grab a light meal and refreshments at the 'Barn Owl' Halfway House, the 'Loeries Flight' takeaway and the 'Albatross' Halfway House. 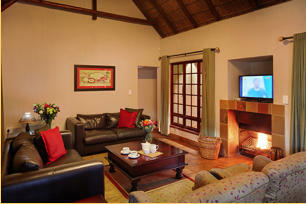 This retreat is nestled alongside the tranquil Magalies River on 120 hectares of natural parklands. The chalets, each with their own private patio, are close to all amenities which the resort has to offer - golf, swimming, tennis, squash, volleyball and sauna as well as ferries and river cruises. 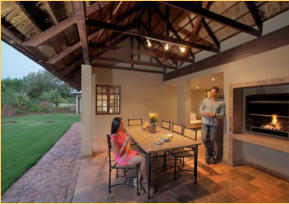 Closely situated to Hartebeespoort Dam, you will truly appreciate the unspoilt beauty of the surrounding landscape.